This pair of 0.59 ct. tw. Natural Fancy Vivid Orangy Yellow marquise diamonds offers a pleasing burst of bright yellow color with orange overtones. They have a Vivid intensity giving them their beautifully saturated color. The diamonds have maximum brilliance and are full of life. The long open faces of the marquise diamonds provide a clear view of the stones’ phenomenal faceting. Light radiates from each and every spot in this lovely and rare eye-shaped marquise cut. 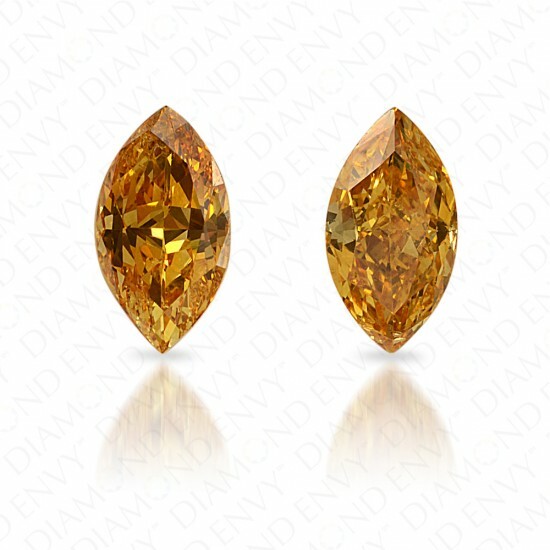 This pair of bright orangy yellow diamonds would look fantastic as accents in a ring or pendant. House-graded.